YAMADA, Iwate — Over the course of five years, an Iwate Prefecture-based NPO has brought in some 2,700 university student volunteers to areas hit hard by the Great East Japan Earthquake and tsunami, performing various duties according to changing needs. 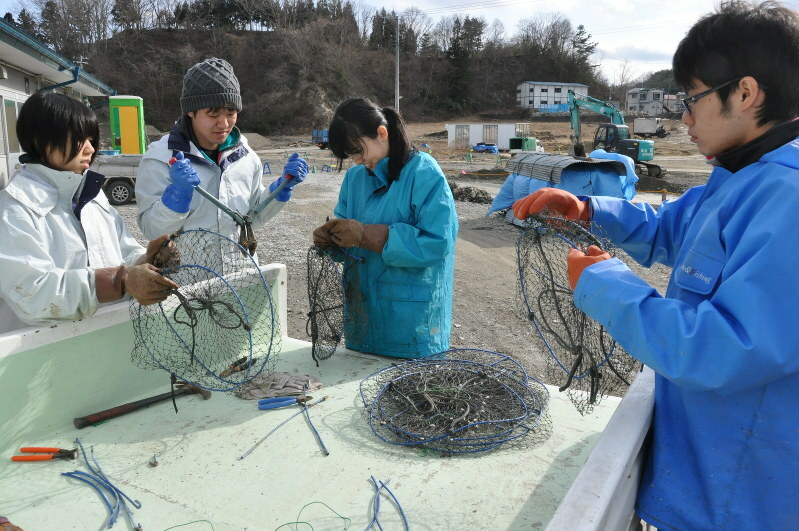 On March 4 this year in the town of Yamada, Iwate Prefecture, home to an oyster-farming industry, four university students helped out one marine farmer by untangling old, used farming equipment for him. It was no-frills work as they separated out the mixed up nets and wire. The marine farmer, Tomohiko Sasaki, 41, was thankful, saying, „I do all of the work from harvesting to shipping to market myself, so it helps me out when they take care of this kind of detailed work for me.“ In addition to separating out the equipment, the university students assisted in work to screen the oysters and scallops Sasaki harvested for shipping and to extract the meat from the shells of oysters. In total the students worked for around five hours. The Iwate Ginga-Net NPO also values the opportunity to hear what people like Sasaki who live in the disaster-hit areas have to say. For the students who helped in the marine-farm work, Sasaki brought them with him to the nearby remains of what had been his father’s house before the disaster. „The tsunami reached up to there,“ Sasaki said, pointing at a hill behind the remains of the house, as the look on the students‘ faces changed. In 2011, the year of the disasters, Iwate Ginga-Net started a project of sending university students on six-day visits to the disaster areas, timed to match long breaks from university classes, and for around three years, the NPO held events at community halls in temporary housing neighborhoods for volunteers to converse with disaster survivors. However, says Yaegashi, the NPO came to see that they needed specialists who knew how to address disaster survivors‘ problems and help them with their traumatic memories. Gradually more survivors started returning to their work at sea or in the fields, and the number of participants at the NPO’s social events dropped. Two years ago the events were stopped, and instead Iwate Ginga-Net shifted to things like helping disaster survivors move house from one temporary housing unit to another, or helping local fishermen with their work. With five years having passed since the disasters, Iwate Ginga-Net has brought to a close its project of regularly bringing in student volunteers from around the country. It will continue to involve local university students in volunteer work, and may bring in student volunteers from other prefectures if there is demand for it. In addition to volunteer work, donations, fundraising and tourism are also ways people can give support.